On December 7th, a resident of the Old North neighborhood caught a man stealing bricks from a stack in front of her house. When she asked him to put them back, instead of complying he hurried into his maroon Jeep Cherokee and drove off. Police did not have a hard time finding the thief. After the resident called in the crime, officers headed to Unlimited Bricks at 2600 University Avenue where, as if following the directions of a brick rustling script, the thief’s vehicle was parked. The man was selling bricks to the yard, owned by Charles Rosene. After the victim identified the man, he was arrested and taken into custody. Readers may wonder how Unlimited Bricks was still in business after the Board of Adjustment revoked its occupancy permit on November 17. (A lot of the credit for this action goes to the tireless effort of Fifth Ward Neighborhood Stabilization Officer Kathryn Woodard, supported by Alderwoman April Ford-Griffin.) While the business had a legal time to appeal that ruling, it had to obey the revocation order pending appeal. Unlimited Bricks — a business that is not incorporated in this state — truly was an outlaw operation when it nearly fenced some stolen front yard bricks. No more. Map of the area around Unlimited Bricks, which is marked by a yellow cross. Thanks to the Old North resident’s complaint, the St. Louis Metropolitan Police worked quickly to get the Building Division to condemn the property for occupancy on December 8. Rosene has had an active occupancy permit since July 1, 2005. Noncompliance with the revoked occupancy permit will land Rosene with fines of $500 per incident, so if you are in the area please check on 2600 University and see if the yard is running. If it is, call the police. They will know the operation all too well. Those who are not familiar with the corner of University and North Jefferson, shown in the aerial photograph above, can be excused. The vicinity of the yard is a waste land of wrecker’s yards and unlicensed dumps. Looking at a summer-shot aerial photograph, one can see how accurate the term “brownfield” is in describing certain conditions of battered urban landscape. This is the vortex where near north bricks go for fencing out of the neighborhood. This area is very much like a black hole that consumes area building stock and churns out cash to a handful of harvesters, again and again until there is no more possible destruction. To the south and southeast of the Rosene property are lots owned by the Hemphill wrecking family. Around those are still more half-used lots. Typically, these lots have tall chain link fencing — often missing in sections — and haphazard gravel paving. The lots have many scrub trees around the fence lines, so that in the summer they are almost forested. In the middle will be some wrecking equipment, salvaged materials or random items. 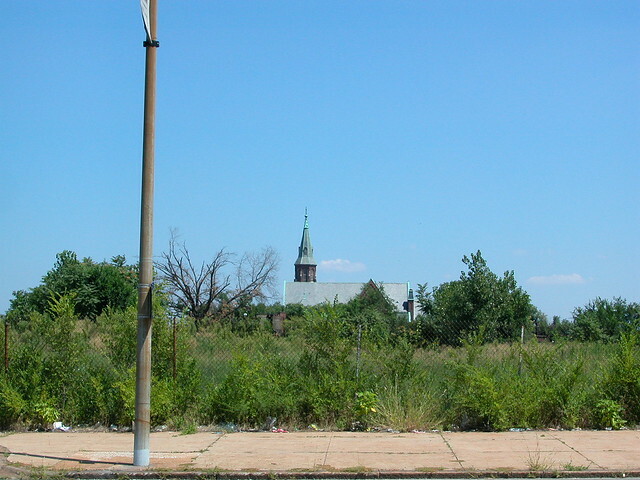 View north from St. Louis Avenue across the abyss of wrecking yards. On the south side of St. Louis Avenue on the east side of Elliott Avenue is a grimly comic landscape of a tall slope of of dirt, dumped from wrecking jobs, on a lot so unkempt one wonders how it can possess any legal occupancy permit. Not all of the yards in the area are so unsightly, and wreckers who hold licenses do honest labor for money. Yet the conglomeration of messy yards around St. Louis Avenue and Jefferson, just northwest of the old Pruitt-Igoe site, are a black eye for the north side. One is not surprised that the Northside Regeneration plan takes aim at this swath of blight. Yet the fact is that it does not take $8 billion plans to shut down illegal brick yards and clean up vacant lots. Citizen action, not the weight of promised redevelopment, has shut down Unlimited Bricks. What else can it do? The building at 2629 St. Louis Avenue, owned by Northside Regeneration LLC. 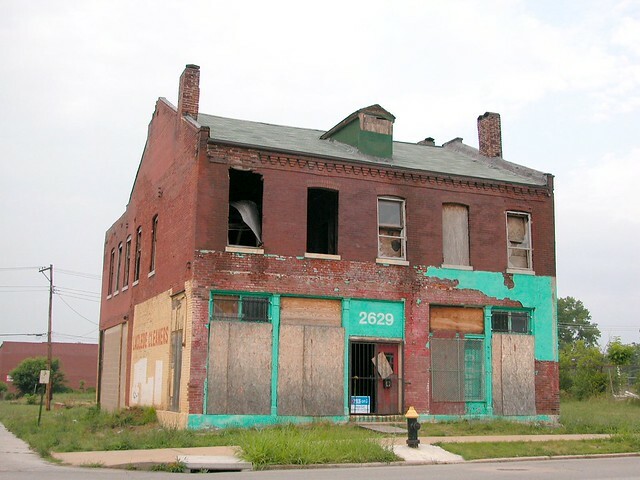 One of the few remaining buildings in the wrecking wasteland is the handsome 19th century commercial building at the northeast corner of St. Louis and Elliott Avenues, owned by Paul J. McKee Jr.’s companies for years now. Its strong form is a vigilant reminder that the dead center can also be a land of urban life, where bricks build community rather than petty fortunes. 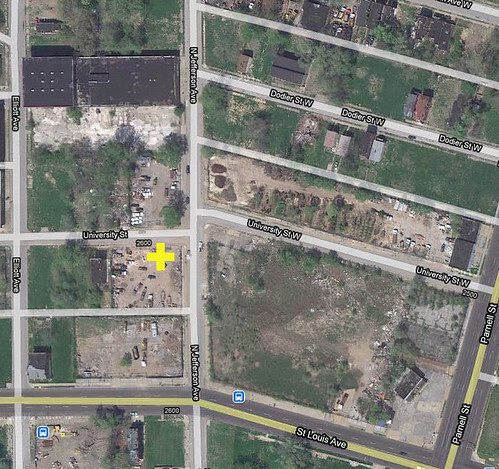 This entry was posted in Brick Theft, North St. Louis, Northside Regeneration, St. Louis Place. Bookmark the permalink. Fantastic! So I assume that having his occupancy permit revoked means he’s been evicted from the land, but can’t he just open up shop somewhere else? Is he going to be held responsible for buying stolen bricks? I am not sure if any charges are being developed. THAT would really be an effective way to end brick theft. It will be very hard to prove he knew that the bricks were stolen unless the police have the brick thief on tape telling him that the bricks were stolen. They aren’t very bright people, but they’re smart enough to keep plausible deniability. One down…Must be like trying to destroy the Hydra. Lop off one head, and two more spring forth. However, good news is good news. ^^ it’s kind of ridiculous though, because where else is a guy going to get a car-load of old bricks to sell if not by stealing them? i guess Rosene just assumed the guy knocked his own house down for the bricks. i mean, that’s the most obvious source, right? I know it may seem ridiculous that someone could come into possession of hundreds of bricks legally, but I know one guy who knocked down his old 19th century ash pit in his backyard and ended up with hundreds of nice old bricks. Also, to be honest, I got close to three hundred bricks for free from a guy in the county who had ripped out his old patio. It’s frustrating, but unfortunately there is that darn plausible deniability that gets in the way. Indeed!!! If they are caught and have evidence, prosecute! Shame on him/them all, we need to salvage the bricks for when we rebuild!!! Chris, these guys would have pickup truckloads of bricks going to them at odd hours of the night. When you see a beat up pickup driving 20mph because the springs are so collapsed the bed is rubbing the tires , it’s not hard to tell that some thing isn’t right. Every one of them headed to this yard. I saw this for 5 years. Legit wreckers hand wreck and stack their bricks on the spot. You can ride and see a house with all the walls gone and nothing left but loadbearing walls. Glasgow and Hebert. How many truckloads do it take to make one backyard BBQ pit. This neighborhood was allowed to be destroyed under the politicians , resource starved people and a developers dream. Charles Rosene is a lawyer in good standing with the Missouri Bar Association. According to the Bar Association he is based out of Spanish Lake. He also seems to have a practice in west St. Louis county and St. Charles County. Connect the dots…I wonder if he knows Paul. Since his name was on the occupancy permit would it not stand to reason that, given there is no other business operating that this address and that the permit specifically stated the yard was to be used for brick storage, he is/was the primary behind Unlimited Bricks? At least in the eyes of the law he should be the one held accountable for what happened on that property. Hmmmmmm…..weird. Look at the last point……????? -Rehabbing seven properties, at a cost of $1.1 million. MunchyBags: Good points on Rosene. He may not be the owner but he is the only person who can and should be held liable. On the Northside recycling center, it’s actually a great idea. I wonder who will run it. Do you have any idea of what six buildings he is planning to demolish? It would seem that they would have to be “unsaveable” for someone to want to spend this kind of money (about the same as a rehab of and existing building) to be left with a vacant lot.